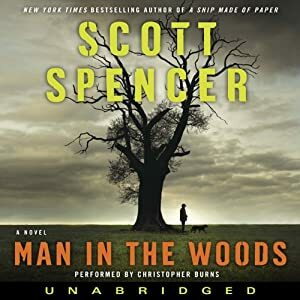 Some reviewers gush with praise for Scott Spencer's new novel Man in the Woods, describing it as a penetrating analysis of the modern American psyche. It isn't, and to overpraise the book will lead to disappointed readers. It is a pleasantly thoughtful tale of accidental murder and the unpredictability of life and death. A man with gambling debts is on the run and ends up dead in the woods. Will justice be done? The book plays with genre a little: there are detectives trying to solve the mystery, but it is not really a thriller or murder mystery. Paul Phillips is a carpenter living with bestselling author, radio star and inspirational speaker, ex-alcoholic Kate Ellis and her daughter, but the book is neither a love story nor a family drama. Some reviewers have focused on the moral side of the book, and it is true that it looks at modern spirituality and the existential pain of living with the knowledge that one has killed another person. But it does not take any of that very seriously and does not have much light to shed on good and evil -- it has a mildly satirical tone and a shrugging attitude to how everything works out. The reading by Christopher Burns is nicely done, although maybe he could have tried to give the book a bit more gravitas rather than sounding like he is constantly winking at the listener with a knowing smile.